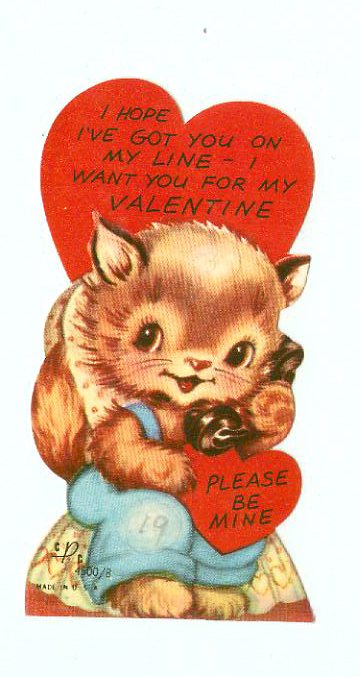 Yeah, Valentine’s Day has passed. 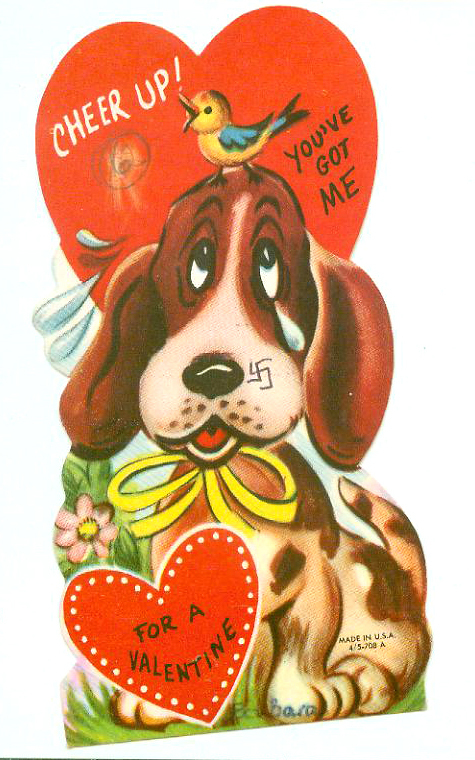 But we don’t like to let the romance die. (Plus, we often post stuff as we find it.) 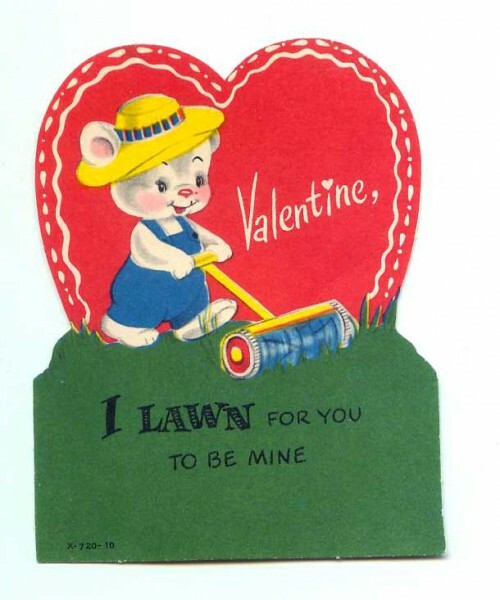 Here’s a sweet little Valentine’s Day poem about a cow. 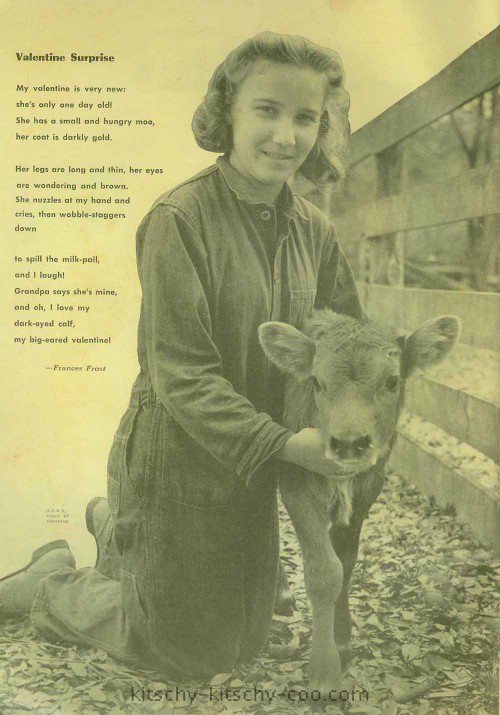 And no, it’s not from 4-H — it’s from the American Junior Red Cross (American Junior Red Cross News, February 1953. This antique valentine is now available for sale at Exit 55 Antiques. You can call the store between 10 am and 5 pm (central time), any day, at (218) 998-3088. 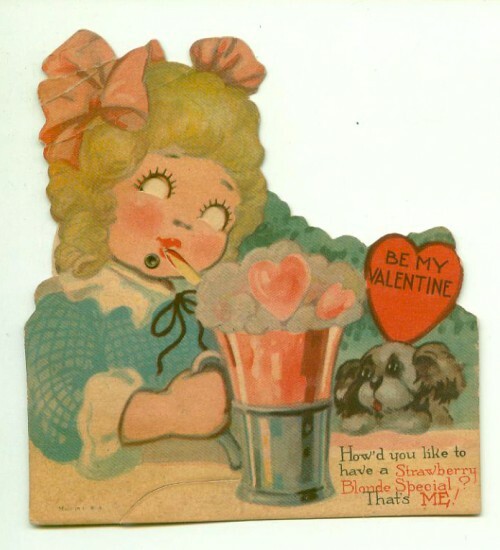 (Just let them know it can be found on EQ’s shelf in the case with the most vintage and antique Valentine’s Day cards.) 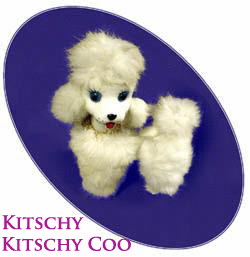 Or contact us at our official business site, We Have Your Collectibles (home of Fair Oaks Antiques), or at the official Facebook page. 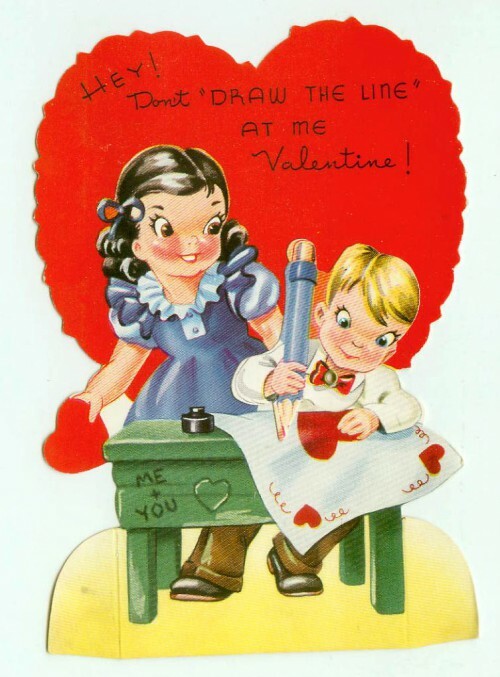 One of the things I like best about vintage Valentines are the puns. That’s probably not surprising to anyone. 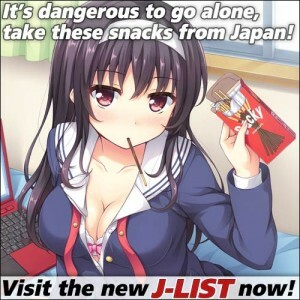 Via . 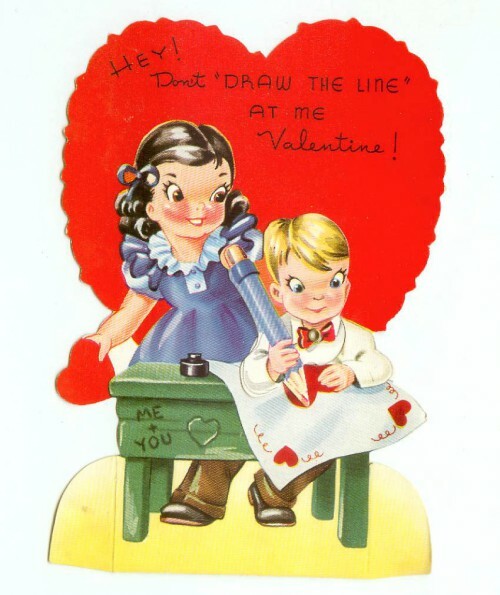 It may seem a little early to start with the Valentine’s Day stuff, but we’re seeing a huge jump in traffic to our previous Valentine’s Day posts (older archives too). Heck, WalMart already has Easter candy out! Not that WalMart dictates anything to me; but I feel fine mentioning Valentine’s Day stuff now. 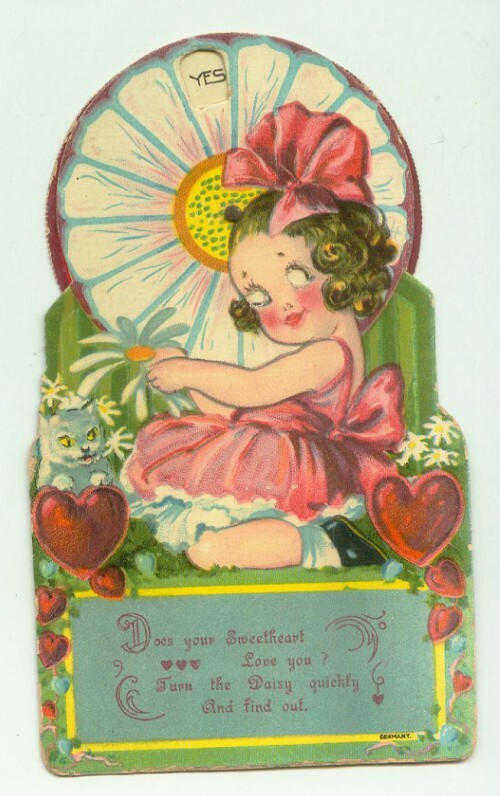 This vintage Valentine is a vintage mechanical Valentine from A-Meri-Card. 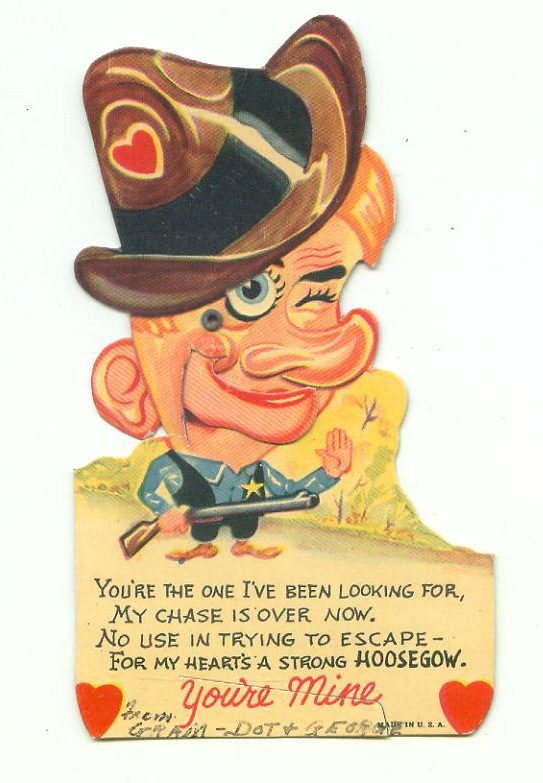 Found at an estate we are helping manage here in Fargo, the vintage Valentine was found inside a folded half-sheet of paper. The paper was a mimeographed list of guests for a Valentine’s Day party. 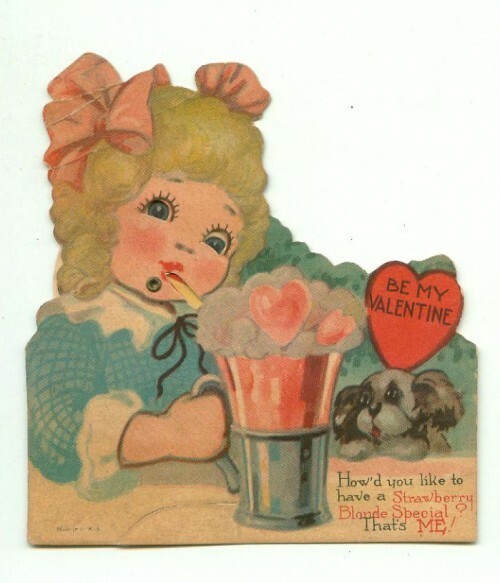 While this was the only Valentine saved, it’s clear that Pursy was not invited to the party. Another example of drawing the line at party guest lists. 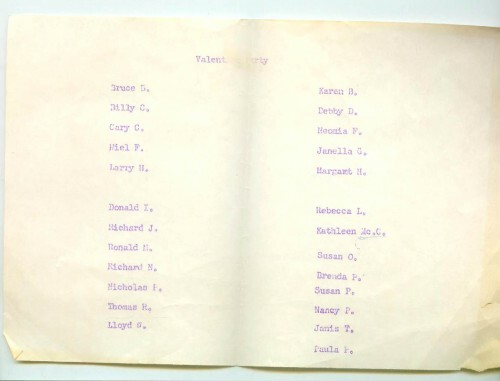 Especially sad when the list has the guests arranged in pairs of one boy and one girl — and clearly there is one girl who had no “date”. Poor Pursy. Poor Paula. 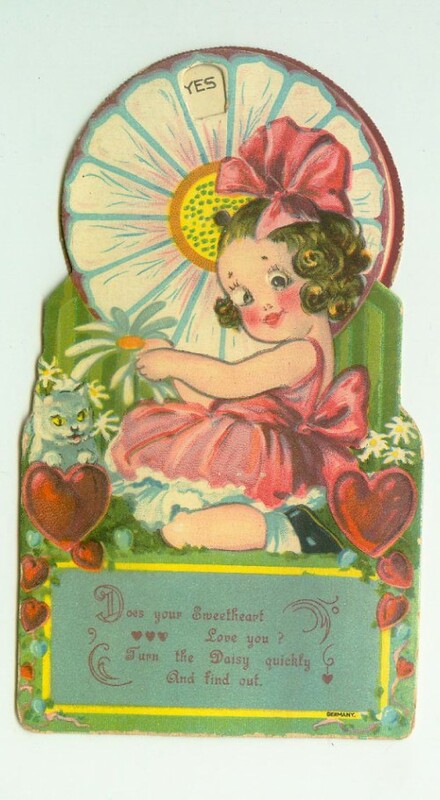 You can find more vintage Valentines in our eBay listings. Those looking for vintage Valentine’s to craft with, check out our “crafty” Etsy shop. 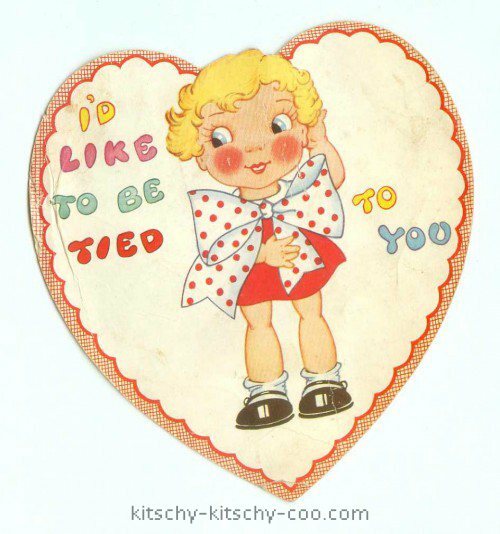 Another pun-filled vintage Valentine that kids would give out in class. 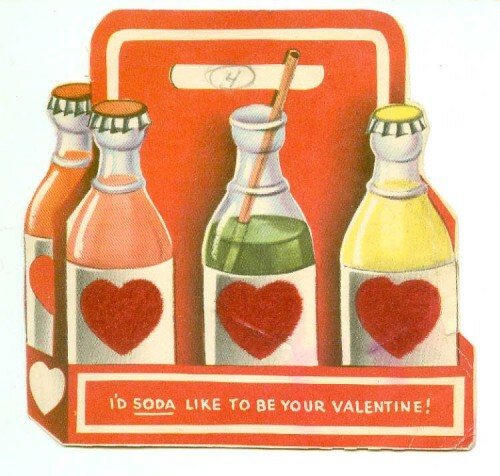 This one features a 6-pack of soda pop, in the paper carrying case (remember those?! ), complete with bottle caps (save for the opened one with a straw). 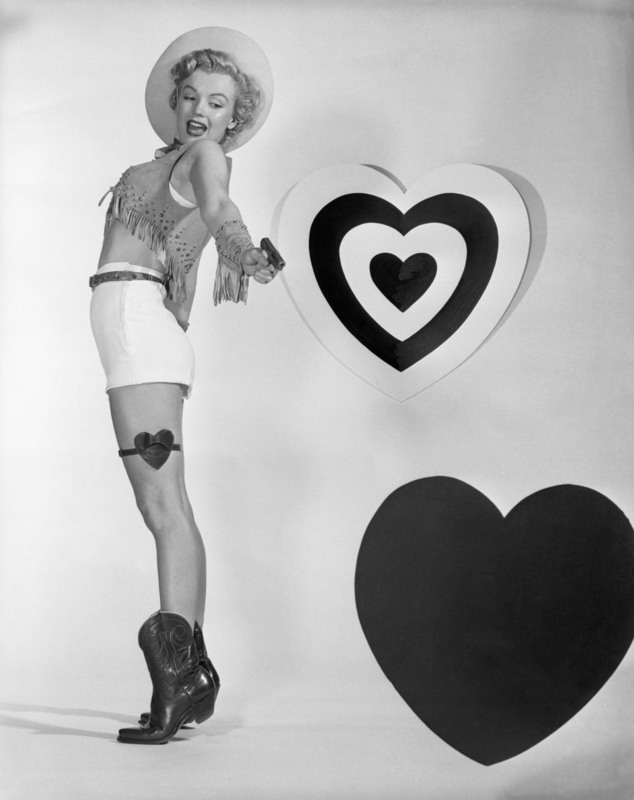 The red hearts are flocked. 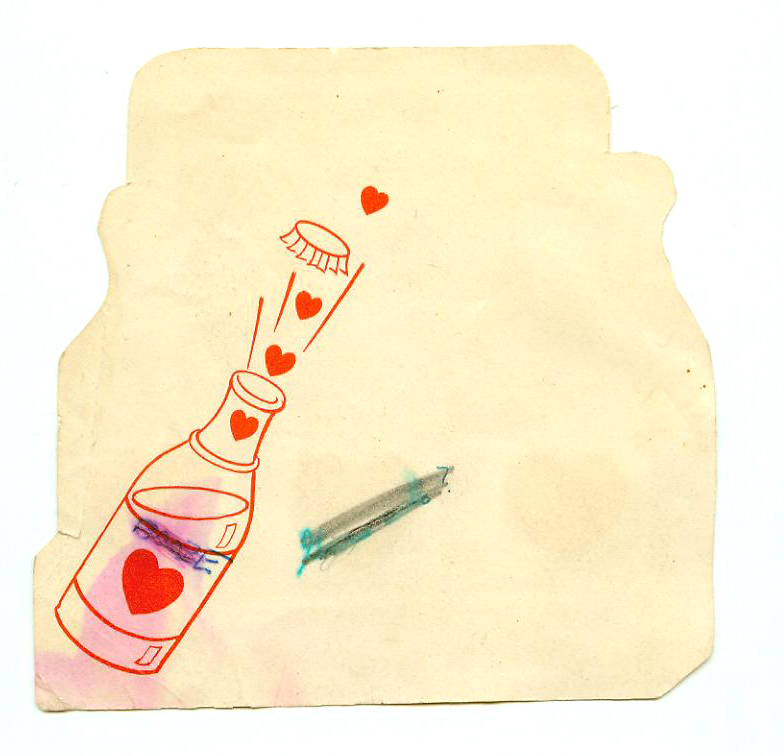 On the back, there’s another pop bottle — with the cap popping off from the force of love bottled inside. Some funny kid wrote the word “BOOZE” on the bottle. …Well, love is intoxicating! 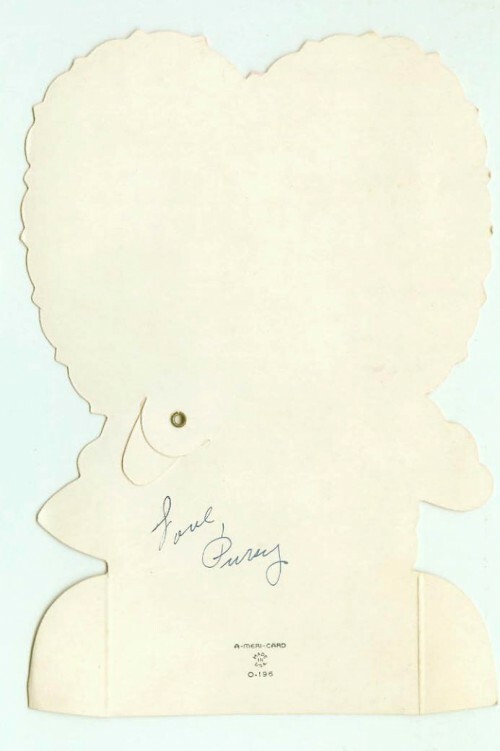 Also, there’s a name crossed out. No marks for maker; roughly 4 1/2 inches tall. 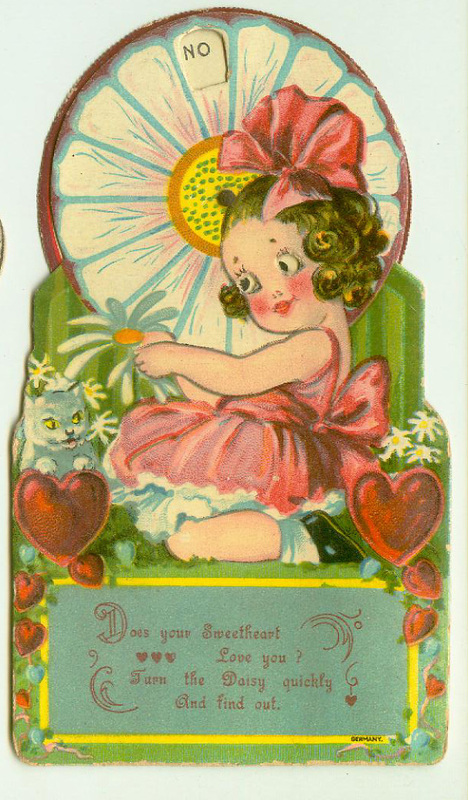 Vintage Valentine with a kitten on the telephone. 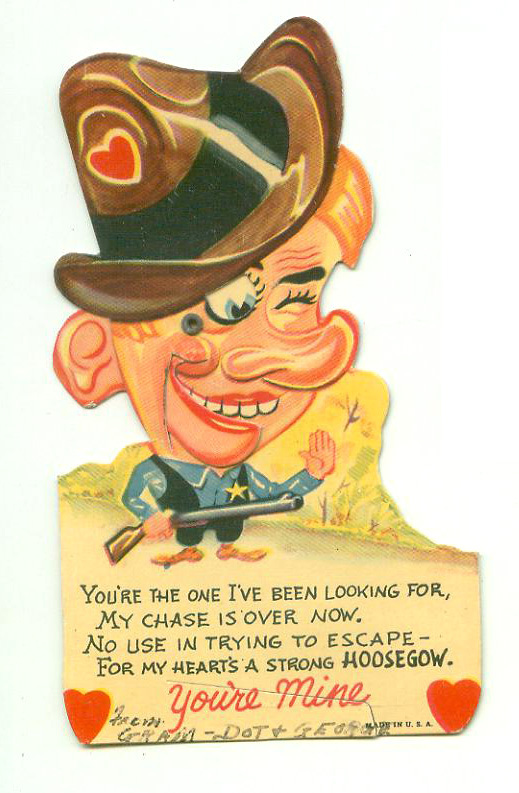 Marked CPC 4500/8, Made in U.S.A.; roughly 3 3/4 inches tall.